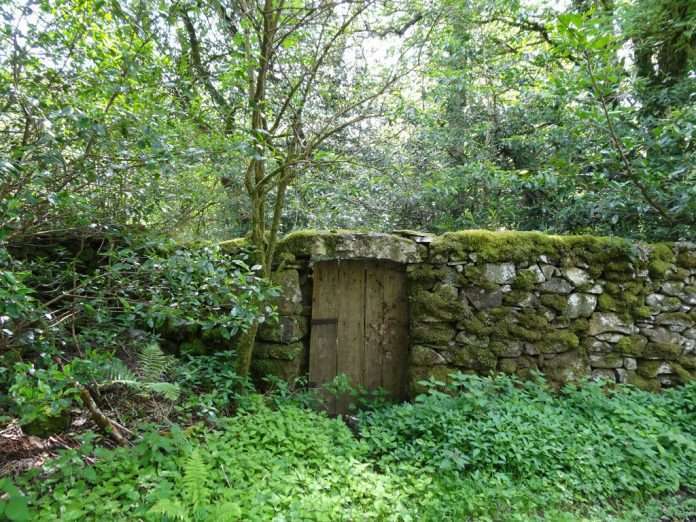 The Old Walled Garden and the Location of “Derwen Ceubren yr Ellyll” (The Hollow Oak of the Demons). 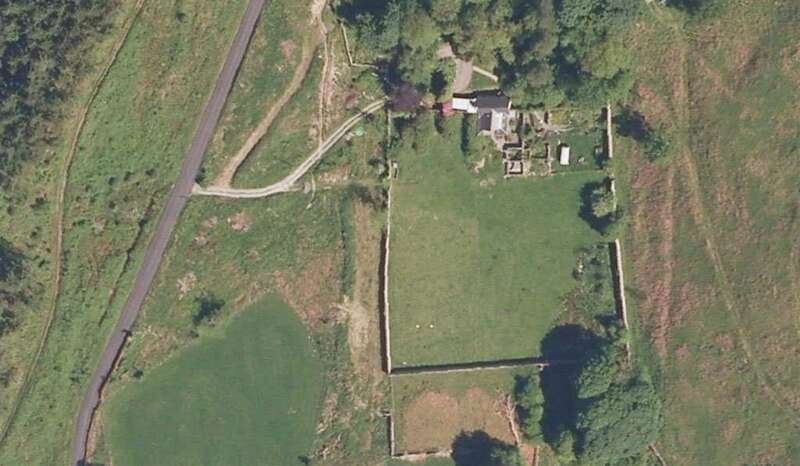 Nannau once had two kitchen gardens, this one, “Yr Hen Ardd” (The Old Garden) is the furthest from the house (a kilometre away) across the Dolgellau to Llanfachreth road. 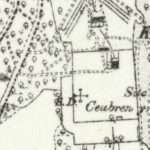 1887 Map of Yr Hen Ardd showing the location of the Tree. This is marked with Cross and ‘SD’ (Sundial). Writing in 1838, Thomas Roscoe, describes a garden with greenhouses, hothouses and exotic plants ‘formed and laid out at extraordinary expense’. He also mentions ‘neat tablets’, one than mentions a servant who died after eating 440 plum stones. 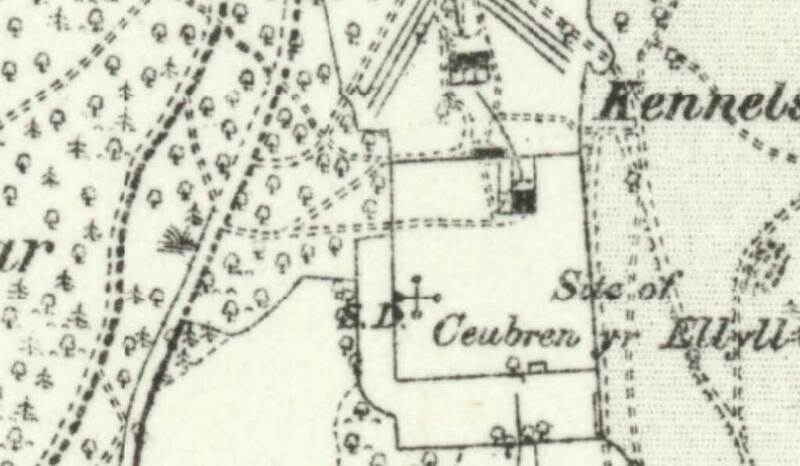 However, as this garden seems to have been built close to the time of writing (as it’s not shown on the 1818 map), this more likely refers to the newer garden built close to the house. Also, there are no signs of any glass buildings on any maps of old garden, only kennels (containing a date plaque of 1835), pigsty and possibly a pheasantry. Well, enough of the pheasantries (sorry). According to maps and references, “Yr Hen Ardd” seems to have been built after 1796, the same time as the new house. There is a plaque on the wall by the east gate of the walled garden, showing a date of 1794, which confirms this time period. The cottage, which is occupied, also seems contemporary with the garden and main house. In 1818, the garden was divided (by means of paths) into nine sections with enclosing walls over eleven feet high in places. There is a stream running the whole length of the garden (as it has for at least two-hundred years). This is accesses by steps to the north, where it runs six-feet under ground. There is a stone pillar against the west wall of the garden which marks the spot where Derwen Ceubren yr Ellyll once stood, although this has been moved closer to the wall in recent years (see photos). 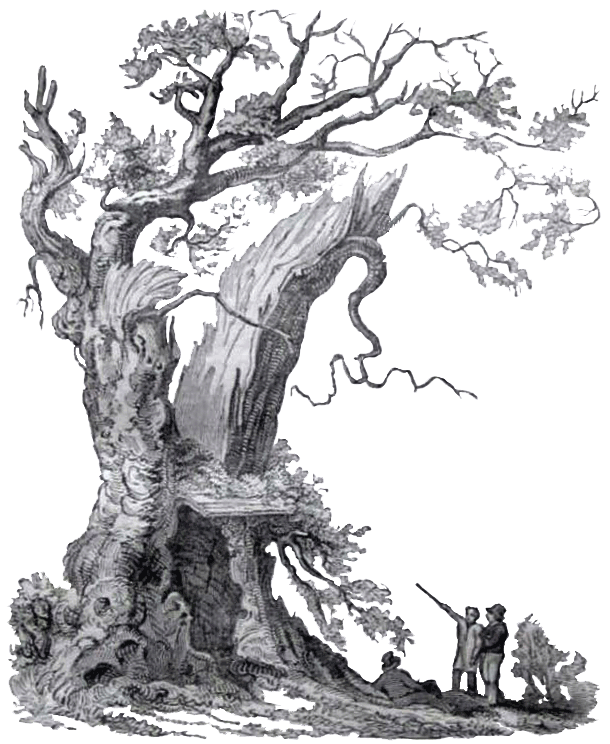 When the tree fell, it was marked by a sundial which is shown on earlier maps as a cross (and S.D.). There was also a plaque on the wall, of which only the two hooks remain. There are a couple of engraved stones in the garden. 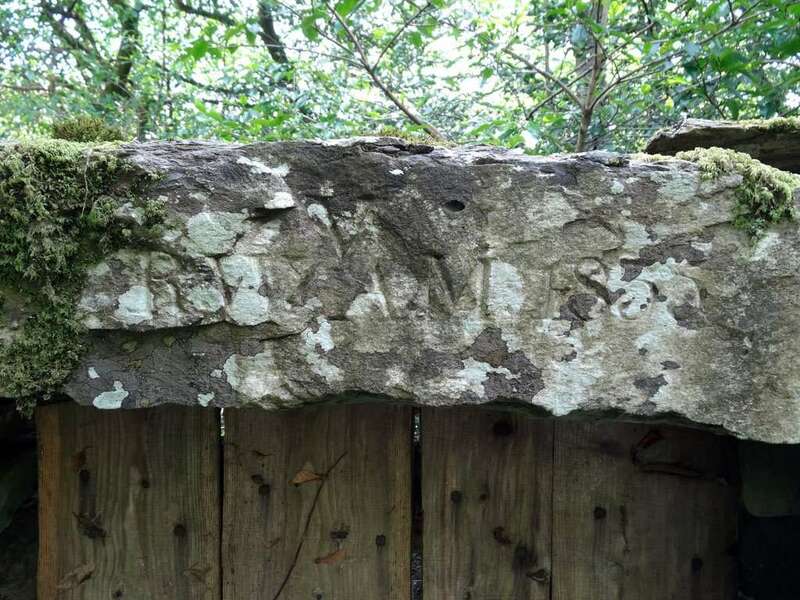 There is an engraving of “RW-V-AM 1835” (Robert Vaughan and Anna Maria) on the lintel above the old wooden door on the disused northern entrance to the garden. 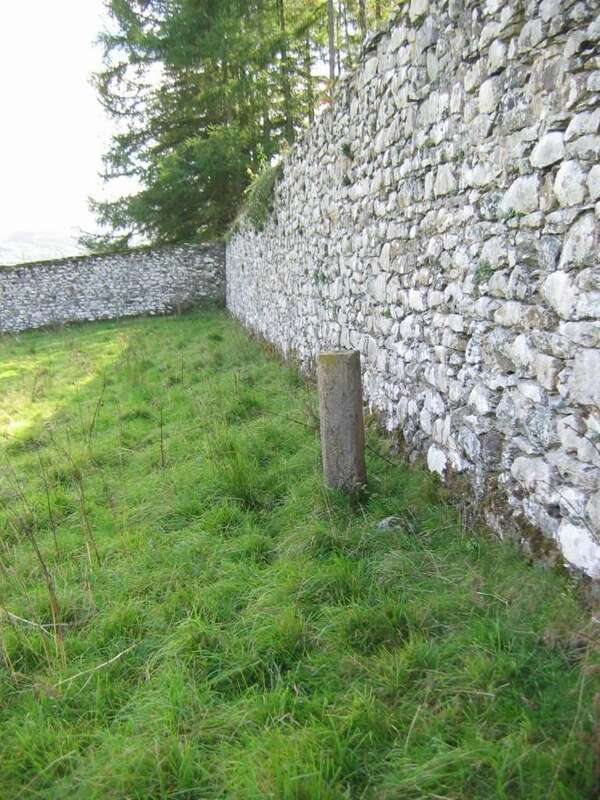 This can be seen (and touched) from the Dolgellau to Llanfachreth road as it’s only a couple of meters off the tarmac, just before Hywel Sele Lodge comes into view. This may well be a later private entrance, after the ‘heyday’ of the old garden was over. There is also a date of 1828 on a stone arch, which is very well hidden, but can be glimpsed from the west side of the Deer Park. This used to mark the entrance to the garden from one of the old roads which no longer exists.